Back in the 1970s the word ‘Samui’ was a known only to a few of the most adventurous backpackers eager to explore this little known and tricky to reach island. Then, a basic thatched bungalow with generator power and running water was considered luxury. 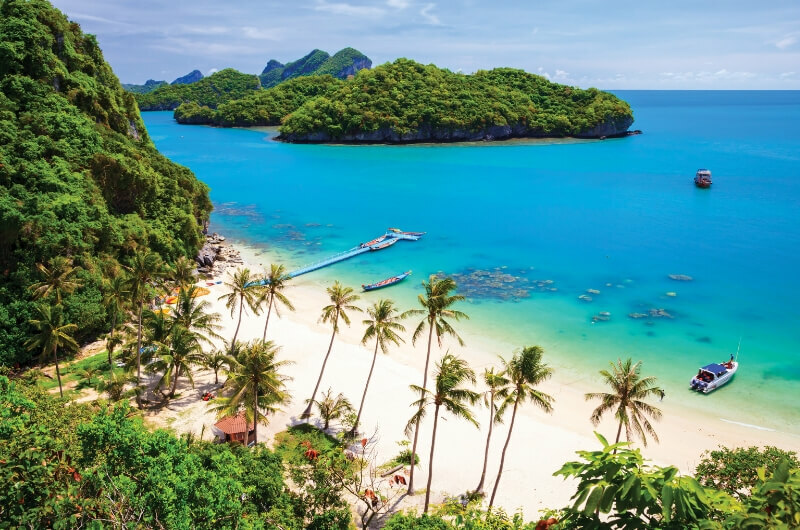 Nowadays, 5-star resorts that rival any world-class destination, occupy the prime beachfront and cliff-top locations bringing the jetsetter crowd to this now well-known and easily accessible island in the Gulf of Thailand. Samui is Thailand’s third largest island, yet measures just 21 kilometres at its widest point and 25 kilometres in maximum length. A ring-road runs around the island for approximately 50 kilometres and links the many beaches and bays, so hiring a car or scooter is recommended, as it’s the best way to explore. Don’t be afraid to venture down an unmarked palm-lined track – this is how you come across some of Samui’s best kept secret beaches. And it’s the beaches, after all, that draw a visitor to a tropical island. Each person has his own idea of what makes a good beach. To some, this may be a secluded stretch of sand with nothing more than a hammock strung between two palms to enjoy a good book while listening to the sea gently lapping on the shore. To others, it may involve ample deck chairs, a barman on hand to keep the mojitos flowing and adjust the shade umbrella, and rubbing shoulders with the hip crowd as they tap feet to the latest tunes playing in the background. Perhaps you’re after a family-friendly beach with plenty of water-sports and activities, or shallow water for the little ones to play in. 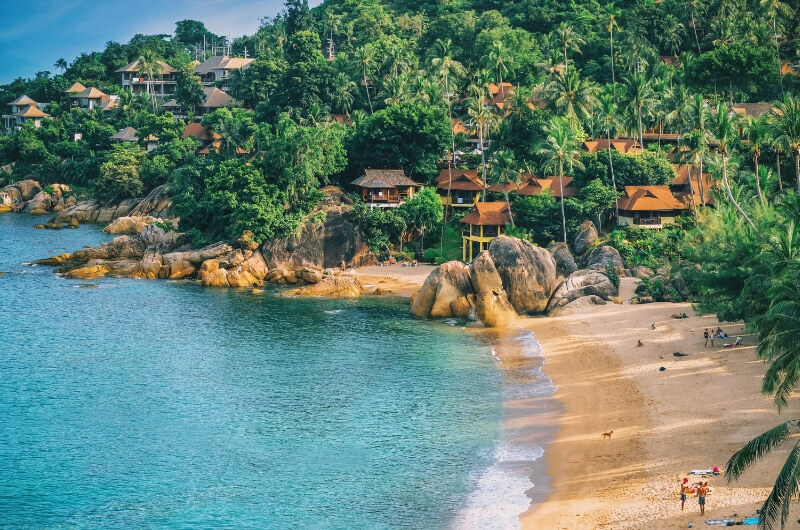 Whichever is your ideal, Samui won’t disappoint with its offering of beaches – from long strips of powdery white sand that stretch on for kilometres, to small boulder-lined coves, ideal for snorkelling. As developed as Samui has become in some areas, it’s good to know that the island observes a quaint building regulation – no building may be higher than the closest coconut palm. Now while these palms can get quite tall, this is still a far cry from the skyscrapers that line Phuket’s (Thailand’s biggest island) shore, and most resorts are still of the villa or bungalow style. If you’re looking for a slower pace, head west and south and get a feel of what Samui must have been like a few decades ago. In Taling Ngam on the south-west coast, many traditional wooden Southern-style houses can be seen still standing in compounds with other out-buildings, containing the extended family. Add to that a granny sweeping outside (there’s always one), several chickens digging in the dirt, a towering pile of coconuts ready for processing and an assortment of dogs stretched out in the road, and you have your average Taling Ngam neighbourhood. There’s hardly a Seven Eleven or Family Mart in sight. Rather, you’ll find the front rooms of houses converted into little convenience stores, manned by granny or whoever is home. Tables are set up roadside, selling bananas, grilled chicken or the crop of the day. The landscape is lush and green, predominantly coconut groves and banana plantations. Here the jungle truly does meet the beach. Oh, and on the beach, don’t be alarmed to see a buffalo or two enjoying a dip in the sea, or lazing under a palm tree. Don’t worry, they’re docile, and there’s usually a handler nearby. You’re also likely to see shellfish collected by hand, or little clams dug out by wiggling toes in the sand, for the evening meal. Long-tail boats bring in the day’s catch. Another beach worth visiting is Choeng Mon at the north-eastern tip of the island. Frequented by expats, this is an ideal family beach, with just enough vendors to be convenient when you’re looking for a snack or drink, but not enough to bother you. South of Chaweng, before Samui’s second largest beach of Lamai, are two small coves, namely Crystal Bay and Coral Cove. The bays are lined with giant boulders, and the water is clear and good for snorkelling. An excellent way to experience Samui is to circumnavigate it by boat. A trip on the Naga, a beautifully Turkish Gullet, offers just that and includes cruising through the Five Islands, home to the swifts, famous for their nests used in birds’ nest soup. No one is allowed on these islands, which are fiercely guarded by sea gypsies, employed to look after the birds and their nests. The Ang Thong (Golden Bowl) National Marine Park is located north and west of Koh Samui, and is within sight of Samui on clear days. It covers an area of 102km2, 18km of which is landmass in the form of 42 islands and limestone massifs, reaching 10-400m above sea level. Previously a hide out for pirates, Ang Thong is now patrolled by the Thai navy, and was established as a national park in 1980. 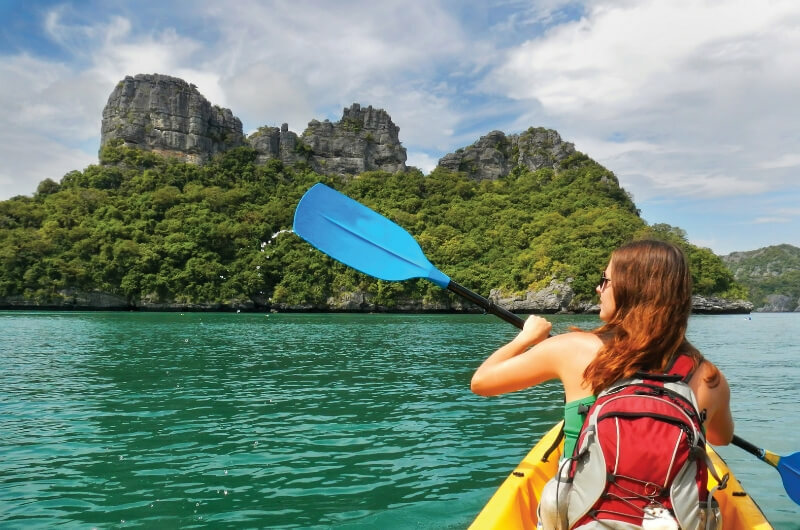 There are several tour operators offering day trips to the park, which include snorkelling and kayaking in and around the limestone massifs – a truly memory-making experience. Most tours will include a relatively strenuous hike up a wooden path on Ko Mae (Mother island) to an amazing view across to the Emerald Lake. This lake was the inspiration for the book and movie ‘The Beach’, starring Leonardo Di Caprio, and in fact most of the movie was shot on location here, as well as at Phi Phi on the Andaman Coast. Samui may not have large shopping malls, but that’s not to say it’s not a great shopping adventure for those in need of a little retail therapy. Along the main Chaweng and Lamai beach roads, boutiques are interspersed with market stalls stocking everything from local designer brands to cheap knock-offs. 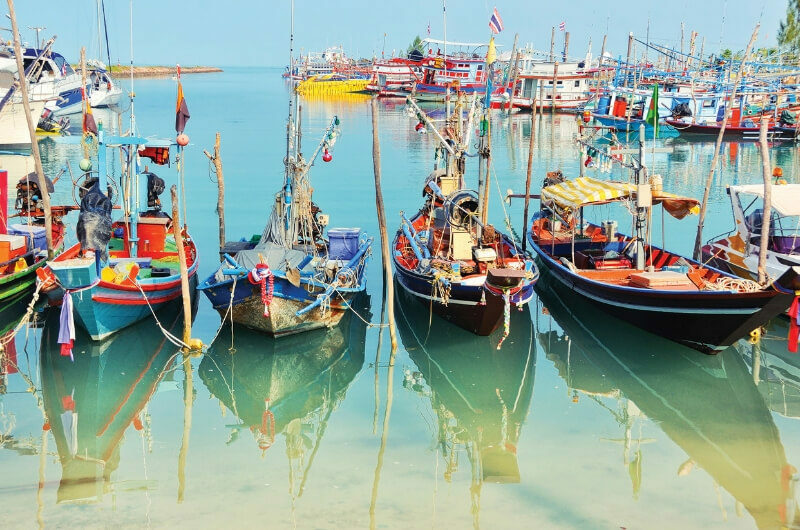 At Bophut’s Fisherman’s Village, East meets the Med, with French-style vintage boutiques mingling with elegant teahouses, and local Samui designer wear outlets are neighbours with seafront coffee lounges. Remember to bargain at market stands, and always do so with a smile. Samui is fast becoming known as a culinary hub in Southeast Asia. This is partly due to its appeal in attracting expats, who move here from all over the globe, many of whom set up restaurants, helping to create the cosmopolitan feel that is Samui. Whether it’s Italian, French, Japanese, or fusion food you’re after, you’ll find it on the island. And of course, you’ll find Thai food. Good Thai food. The island draws some of the best chefs that the country produces, who are keen to show the world what great Thai food is all about. As the afternoon shadows lengthen, Samui puts on her evening dress. Sun-loungers are pushed together to form dining platforms, beautifully laid tables are set out at the water’s edge and fairy lights and lanterns adorn the trees, transforming the beaches into a fairyland dining setting each evening. But part of travelling is trying out the local dishes. A good introduction to street food is at one of the ‘walking street night markets’. Each town hosts its own market on different days of the week. ‘Beach kitchens’ can be found at the most popular beaches. From a tiny charcoal grill, a cool-box and a small chopping board, the vendor prepares grilled corn on the cob, chopped fresh fruit, spicy papaya salad, grilled chicken, fish and sticky rice. 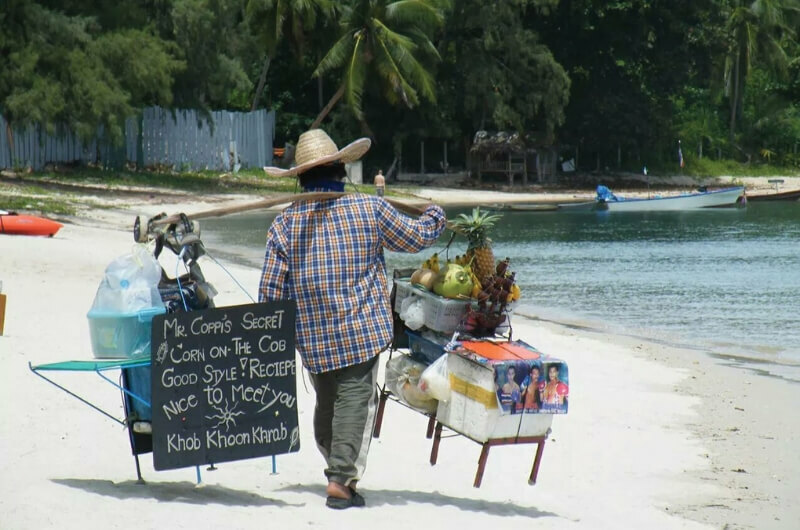 Be sure to try Mr Coppi’s Beach kitchen on Choeng Mon Beach, he has quite a following. Golf enthusiasts will be wowed with the Santiburi Golf Club, its diverse landscape showing a sharp contrast between manicured areas and wild regions. Alongside rolling fairways, you see rugged moss-covered rocky outcrops dripping with water, or coconut groves next to a perfect green. This five-star, 18-hole, par 72 course was designed to make the most of not only the mountainous landscape along Samui’s northern shore, but also the sweeping views. The terrain stretches from 30 metres to 290 metres above sea level, with greens and fairways strategically positioned between waterfalls, creeks and ravines. If you’re after something less strenuous and prefer a little pampering, the choices are endless from 300 baht beach massages to all-the-frills 5-star spas and detox retreats. Samui has its fair share of impressive temples, with the most iconic being Big Buddha (Wat Phra Yai), located at the north-east of the island. The statue, at 12 metres high and glimmering gold, is visible from kilometres away. Wat Plai Laem is located a few hundred metres past Big Buddha on the way to Choeng Mon. This is a living and active temple, with two 20-metre statues, one of Guanyin, the goddess of mercy and compassion, and the other, the Laughing Buddha, which represents the Chinese-Thai beliefs. Both statues sit on platforms reached by concrete walkways, amid a man-made lake teaming with catfish, carp and turtles. Considered an act of goodwill, Thai Buddhists feed these already fat fish, and for 10 baht, buckets of food can be bought from automated machines that chant a prayer of thanks before filling the bucket with fish pellets. During Loi Krathong festival in November, the temple’s lake is a hive of activity as locals come to float their homemade lotus-shaped krathongs in the lake. It is a spectacular and peaceful experience to watch hundreds of colourful banana-leaf receptacles filled with incense and candles floating under the full moon. 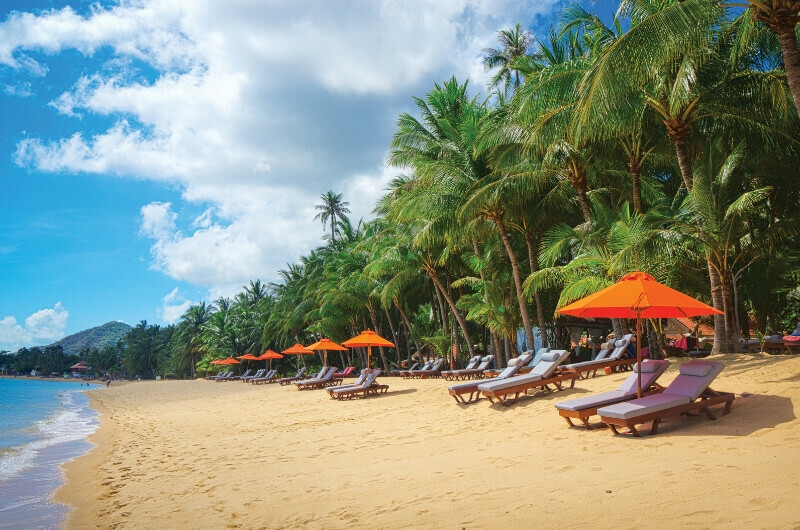 It’s easy to see why Samui hosts over a million visitors annually. The little island that was once a best-kept secret, is all grown up. 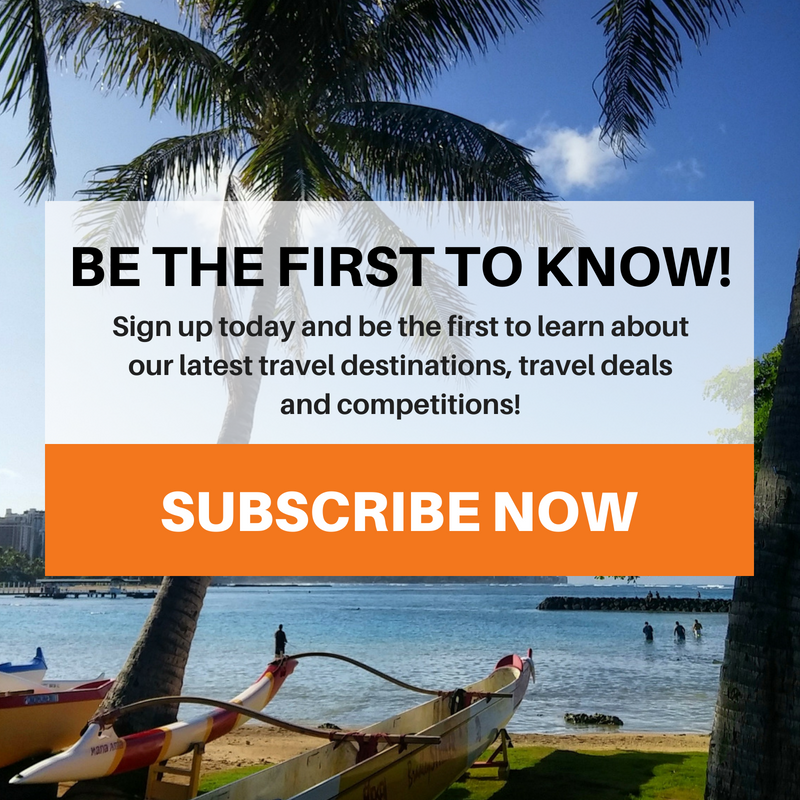 There’ve been hiccups along the way as it’s been overwhelmed by sudden popularity, but now Samui has found it’s feet and blossomed into a gem of a location that appeals to all travellers from backpackers to the elite. From adventure to spa and gastronomic tourism, for those after a party to those who just want to relax on a perfect beach, Samui is sure to please. Samui has a tropical climate, with year-round daytime temperatures averaging 28-34°C. The rainy season is from September through to January, where one would typically get a short afternoon shower. The main monsoon is during November. February to May are the driest months. Larger restaurants and typically those in resorts, will add 10% service charge to the bill. Small roadside cafés will not expect tips, and at other restaurants a small tip is welcome, but not expected. Cars are readily available for hire at reasonable rates from your hotel or other outlets. Generally it is cheaper to hire from the resort that from one of the large international car hire companies. Many tourists hire scooters which is a fun way to explore the island, but be sure to wear your helmet. A boat trip around the island or to the Ang Thong National Marine Park. • The juice from an ice-cold, young coconut. • A banana and Nutella pancake from a street vendor. You’ll see signs at temples asking you to ‘dress polite’. Please dress respectfully when visiting religious sites.